So, we hadn’t been to Sri Lanka previously but, having taken a recommendation from a friend, we added it to our sojourn around South East Asia. We are here for around three weeks and have a driver / guide with us for two of those weeks. Just to give you a flavour, Sri Lanka (formerly Ceylon) is a ‘tear drop’ island just off the South coast of India. While it is a tad smaller than our own Emerald Isle, the population is over 20M! It has a very multicultural mix, numerous religions and a strong Buddhist heritage. There are two primary languages, Singalese and Tamil, though we have had no real difficulty conversing with the locals in English as it is widely spoken. The commercial capital is Colombo, the currency is the Sri Lankan Rupee, they drive on the left, diesel is €0.68 a litre and, importantly, it has a tropical climate albeit cooler on the hills in central Sri Lanka. Entry requirements are very straightforward; we applied in advance on line for our 30 day Electronic Travel Authorisqtion (ETA), which on payment of the US$20 fee each, comes through automatically. 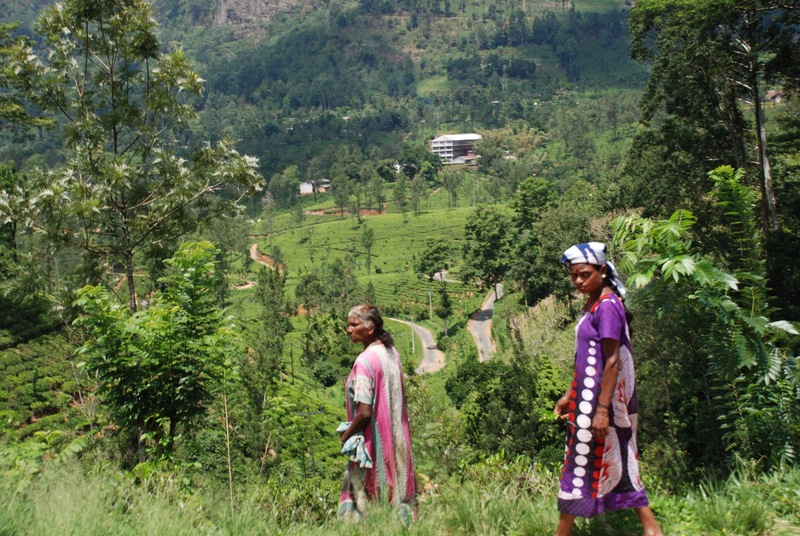 When we met our driver, Asela, he told us that Sri Lanka was famous for three things; tea, gems and hospitality -and that concurs with our own experience to date. So, we set off on one of our day trips from Kandy up in the hills, down through the valleys, passing the magnificent Royal Botanical Gardens along the way, slipping in and out of small villages. 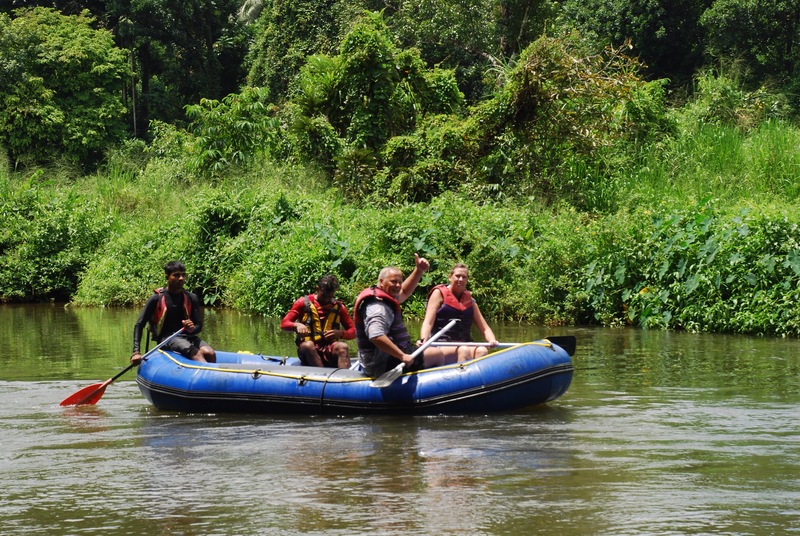 We are off up to the Kelani river in Kitulgala for some white water rafting! We have done a couple of these previously over the years and they tend to be good fun. 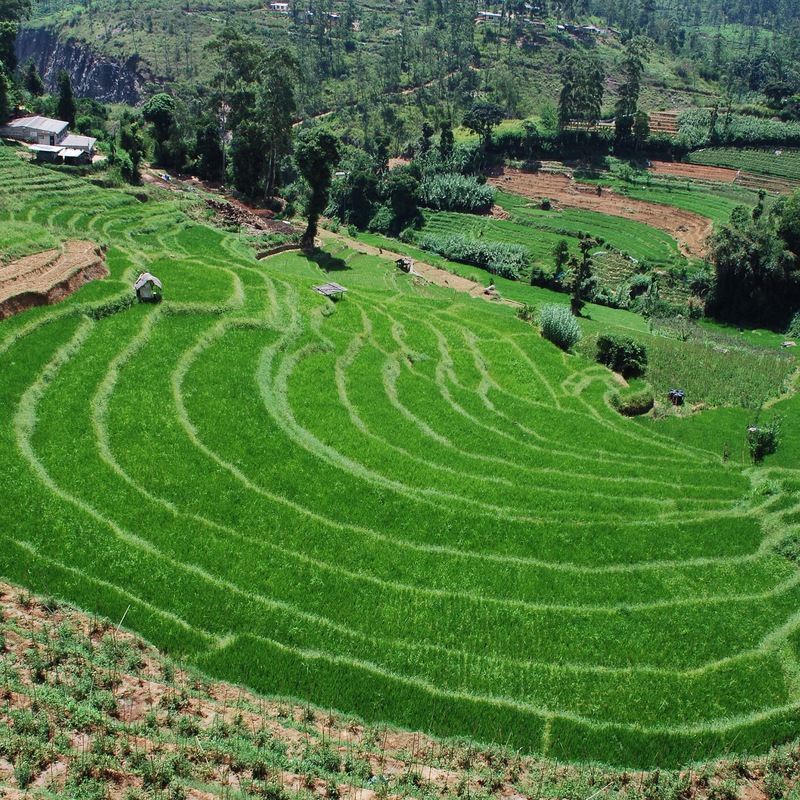 The countryside here is absolutely amazing, lush green paddy fields in many places (there are numerous rice varieties, none of which include ‘Uncle Ben’), thick jungle in other parts, and then again you will turn a corner and be in one of the many exquisite tea plantations. One minute you are admiring the spectacular view to your right over the upward winding cork screw roads, then in an instant you find yourself clinging to the other side of the cliff edge with deep gorges and, just five minutes later, you are on a flat plain with paddy fields, water buffalo and egrets. Stunning! So we are winding our way up, down and over to Kitulgala, getting ever increasingly higher in the hills. The traffic, or rather the driving culture here is outrageous. There seems to be some code amongst the locals that they have priority on the roads over anything tourist related. They are constantly tooting the horn, and trying to overtake. On our trip to Kitulgala there are numerous instances where we are overtaken on a sharp hairpin bend at the side of a cliff and, on one occasion, we are overtaken simultaneously on the inside and the outside! 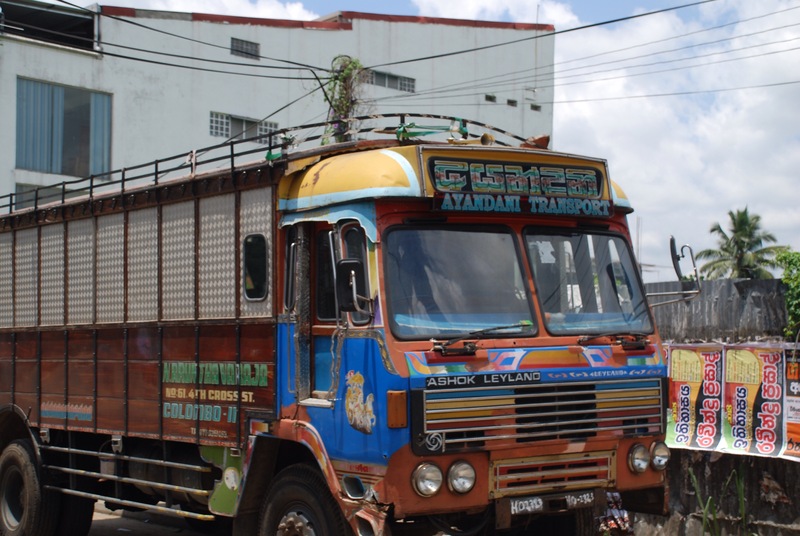 Certainly beyond the main cities you see very few saloon type cars; it’s all four by fours, tractor machines of differing design, colourfully designed old Leyland buses and trucks, and thousands upon thousands of tuk tuks which seem to be the main mode of transport. This might explain why most tourist related transport stands out for special treatment. You are also as likely to bump into a cow around the corner as a car, so extreme caution is called for at all times. So, we are now high up in the hills with precipitous drops over the edge to the raging river way down below. We are beginning to wonder why we are all the way up here when the river is so far below. Then we notice a number of stalls / shacks clinging precariously to the cliff edge and filled floor to ceiling with rafts, life vests and paddles. Somewhat to our amazement our driver pulls over. Surely not? But Asela gives us the nod -this is our destination! We get out, there are a group of five or six lads playing cards & looking at us with amusement. We go to the side of the stall and gaze way down to the river below, we look at each other & back to the lads – they snigger even more. Well we were having none of it and ask the price – the card game was over in a second & the lads split. After some haggling we eventually agree on a price, still fleeced no doubt but we couldn’t let on. So after signing our lives away, our lado hands us the life vests, helmets and a paddle each and tells us to make our way down to the water. Feck sake – we are up a mountain (with a paddle), is he having a laugh? No apparently! 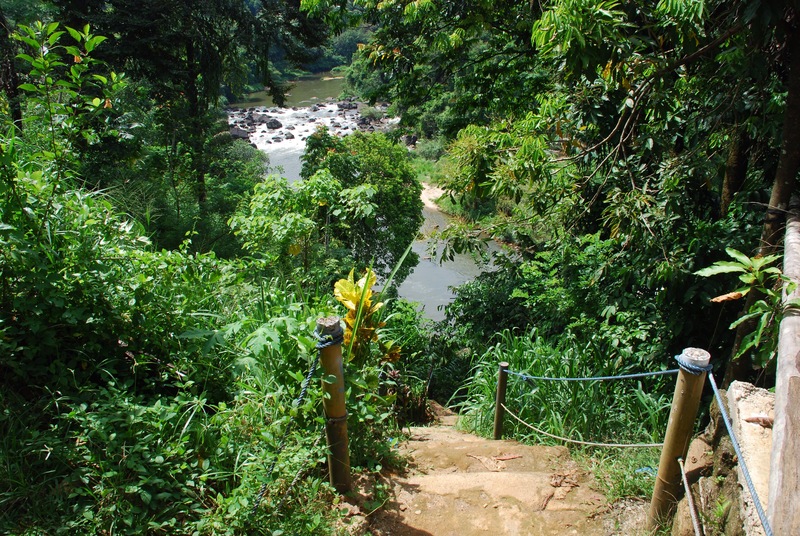 So, donned with our safety gear we clumsily head for the edge and down some 150 steep steps to the river side. We somehow manage not to hit each other with the paddles on our trek down and arrive safely but there is no one in sight. We can barely see the river with all the jungle growth. There is no boat, just ourselves looking very foolish and sweaty at this point. We look back up the path we came down and can hear a swishing sound. Next, out of the blue we see a raft heading straight for us at speed tethered to a guide wire from the top, gathering further speed as it careers towards us- we run for cover. Of course the lads have it under control from the top, just making us work for our rupees. Two other lads then just appear out from the bushes, they disconnect the boat & carry it, currach like, to a small sandy clearance by the river bed. The instructions were simple, when he shouts “forward” we row forward, same obvious logic for “backwards” and “relax”. The only other instruction is “duck in the raft” at the appropriate juncture. So we head off, the two of us up front. There follows lots of instructions to paddle forward, relax, forward again, relax and then we approach one of the smaller rapids. Easy, peasy, smooth as you like, winding down the river between still sections and the rapids. Then we approach what he describes as a “big rapid” and we get that bit more anxious as he calls out “duck in the raft”! Splash, bang, wallop, splutter, but we survive and are very pleased with ourselves. He tells us we “did good” as some other people have fallen out on this stretch! But not us. As we gather our composure and spin around facing back up river, he calls out “forward”. Now I am wondering why we would want to be trying to go back up river, given the likely impossibility of getting back up the rapid. But no, that was not the intention. We row to the point where the water was gushing fiercest, and then, well of course it filled the boat, almost washed us out of it and we must have drank a few pints of it. The lads nearly fall out of the raft laughing – great fun at our expense. Feckers! We paddle along down river for close on four kilometres in all. Through lush jungle on either side, the odd kid swimming in the river, the occasional water buffalo stretching for choice greenery and of course the odd false sighting of a crocodile by the lads. All good fun. One interesting aspect of the river run is that while the river is called the Kelani, it was the site for the famous movie that I have seen countless times, yes, you’ve got it, ‘The Bridge over the River Kwai’. The foundations of the bridge supports can still be seen – but no sight of any train engines in the water! As we get near to our destination, we all bail out into the water – poor Mares didn’t quite expect to go fully, albeit briefly, underwater, but after a few gasps for air she bobbed right up and we all floated down separately a good stretch of the river, trying not to drink any more of the water. Finally we get shore side again, but my big fear at this point is whether we have to climb back up the hill to roadside, possibly lugging a raft over our heads. But no, God was good to us today, we had come ashore almost roadside so simply showered and got back in the car for the trip home to Amaya Hills, overlooking Kandy. A good day was had by all, including ourselves and the lads. Pesky good natured cretins! When you can’t see in the dark …..
Life in the slow lane …..